Ventura, Calif., police are looking for three white men who reportedly poured lighter fluid on a homeless African-American man and set him ablaze. 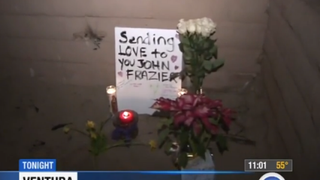 According to ABC 7 Los Angeles, around 11 p.m. Saturday, the three men approached John Frazier, 58, who was sleeping inside a sleeping bag in Ventura's Pierpont neighborhood. The men reportedly poured lighter fluid over Frazier and his belongings and then set them on fire. A passerby saw the 5-to-6-feet-high flames and used sand to extinguish the fire before calling the police, ABC 7 reports. "Frazier suffered second- and third-degree burns on his upper torso and face, but is expected to survive. He remains at Los Angeles County+USC Medical Center," according to ABC 7. Officers told the news station that when they arrived on the scene, Frazier's belongings were still smoldering. "Who would be so cruel to do something like that to a human being? I could see if, I don't know, it was a pile of trash, but I mean, that was a human being," Peter Cardindale, who lives in the area, told the news station. Ventura police have no motive for the attack and are reportedly looking for three white males "in their late teens or early 20s with shaved heads and dark clothing," according to ABC 7. Neighbors have left flowers and candles in the area where Frazier was attacked. "It's just really sad. It's sad that a man is sleeping on the beach and then three knuckleheads just put him on fire for whatever reason," Ventura resident Charon Shirk told the news station. "It's just sick. It's really sick." Read more at ABC 7 Los Angeles.